Clever marketing? 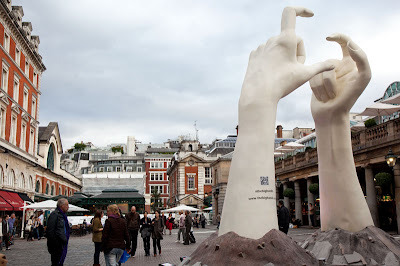 Well I did go to the website to see what these giant hands were doing in Covent Garden. Nikon is the answer. They've just appeared, weren't there when I went the other day, unless I was looking in the other direction. Haha very clever way to get some attention ...nice one Nikon! !Great find Mo. I really hope you shot this with a Canon. Clever marketing indeed. Steffe's comment made me laugh. You have the most clever marketing in London. Great find Mo. I'm confused. Does Nikon make left-handed cameras now? The hands are clicking with the wrong finger. Typical of London life, some toe rag has pinched the camera. Nikon should have known better! There was definitely a giant camera in those giant hands when I walked past on Wednesday around noon. Aaah, what a brilliant installation!